I see parting mints at the cashwrap, and hospitality coffee and tea at many high end retailers, spa and personal service retail. I am sometimes even asked personally if I care for a water or beverage, and once was offered a Champage at Armani. 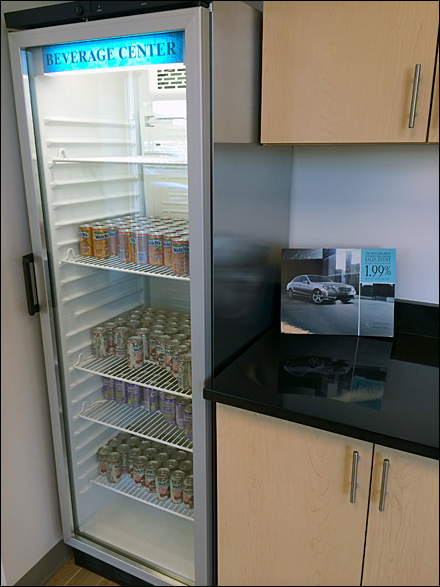 But this Mercedes dealership had a help yourself policy to a cooler of juice choices. I could have taken all I wanted, no one watched or seemed to care. 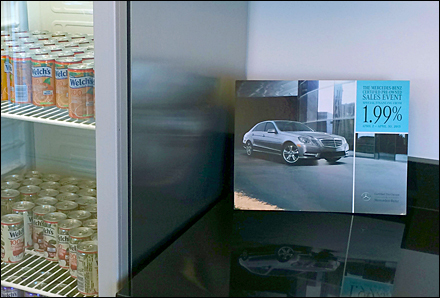 Maybe Mercedes Benz is celebrating topping the list of Luxrury cars in the United States for 2014, a position they had lost for a few years. But given the wide breadth of models and price levels, in truth Mercedes and others are more “Accessible Goods” than true Luxury. The new CLA makes the marque even more accessible. But MB remains a “Positional Good” none the less.